• The Generals and Stars play game 4 of the 5-game series at Huntsville with the Stars leading the series 2-1…the Generals have dropped 3 straight series’ after winning their first 3 and are 4-6 in the last 10 games. • All 9 players in the Generals starting lineup recorded at least 1 hit as Jackson snapped their 5-game losing streak with a 7-2 win over Huntsville on Wednesday night. • LF Leon Landry (3×4, 2 R) led the team with 3 hits, while 2B Patrick Brady (2×4, R, 2B, RBI) recorded the only other mult-hit contest. Brady, CF Jamal Austin 1×5, RBI), SS Ketel Marte (1×4, RBI, BB), RF Dan Paolini (1×4, R, RBI), 1B Mickey Wiswall (1×4, RBI) and C John Hicks (1×4, R, RBI) each drove in 1 of the teams 7 runs. • Starter Trevor Miller (6.0,5,2,1,1,3) recorded his first win of the season, allowing 2 runs (1 ER) on 5 hits in 6.0. • RH Moises Hernandez (1.0,1,0,0,0,1) and RH Mayckol Guaipe (2.0,1,0,0,0,2) combined to hold the Generals scoreless over the final 3.0 innings in relief. • SS Ketel Marte has hit safely in each of his last 9 games, batting .306 (11×36) with 4 runs scored, 3 doubles, 1 RBI, 2 walks and 5 stolen baes. This is his 3rd hitting streak of 7 or more this season…After recording only 2 stolen bases in his first 17 games to begin the season, Marte has stole 8 bases in his last 14 games. • RHP Trevor Miller (1-4) won his first game on Wednesday night since 8/26/13 vs. Chattanooga. It was his first road win since 8/30/12 while with High Desert at Rancho Cucamonga, 11 road starts. • Also on Wednesday, every General in the lineup recorded at least 1 of the 12 hits. It was the first time this season that everyone in the lineup produced a hit. • OF Leon Landry was 3×4, with 2 runs Wednesday logging his 2nd multi-hit game of the season and first 3-hit game since 6/15/13 at Birmingham…It was his first time scoring 2 runs since 8/8/13 at Mississippi. • The Southern League announced Monday that LHP Cam Hobson has been named Southern League Pitcher of the Week for his performance April 29-May 4. Hobson made 2 starts this past week going 1-0, with a 0.00 ERA having tossed 13 scoreless innings. He allowed just 9 hits while walking 2 and striking out 4 this week. Hobson picked up the win last Monday during the season finale at Mobile firing 6.0 shutout innings and followed it up with 7.0 shutout innings in a no decision on Saturday night against Pensacola. • RH Stephen Kohlscheen has allowed 1 earned run over his last 15.1 innings in relief (10 G). Overall this season he is 1-0 with 2 saves and a 1.08 ERA (2 ER, 16.2 IP) in 11 relief appearances. He has limited opponents to a .226 average (14×62), while walking 1 and striking out 19. • AAA: Tacoma 4, at Reno 3 17-13, 1st, +2.5 W-Luetge (2-0)/S-Bawcom (4) DH Nick Franklin led off the 9th inning and scored the winning run on a passed ball as Tacoma defeated Reno 4-3 on Wednesday night. Franklin (2×4, 2 R, HR, RBI) recorded his 3rd consecutive multi-hit game, while also recorded his 6th home run of the season with a solo blast with 2 outs in the 3rd inning. • A+: at Rancho Cucamonga 5, High Desert 3 19-15, T2nd, -1.0 L-Shankin (0-1) The Mavericks allowed 2 runs in the bottom of the 12th inning as High Desert lost to Rancho Cucamonga 3-5 on Wednesday night. • A-: Clinton 20, at Burlington 17 16-15, T4th, -7.0 W-Pagan (1-0)/S-Kauppila (1) Trailing 17-1 after 5 innings, the LumberKings scored 6 runs in the 6th inning and 5 runs in each the 8th and 9th inning to tie the game before adding 3 runs in the 12th inning as Clinton defeated Burlington 20-17 on Wednesday night. 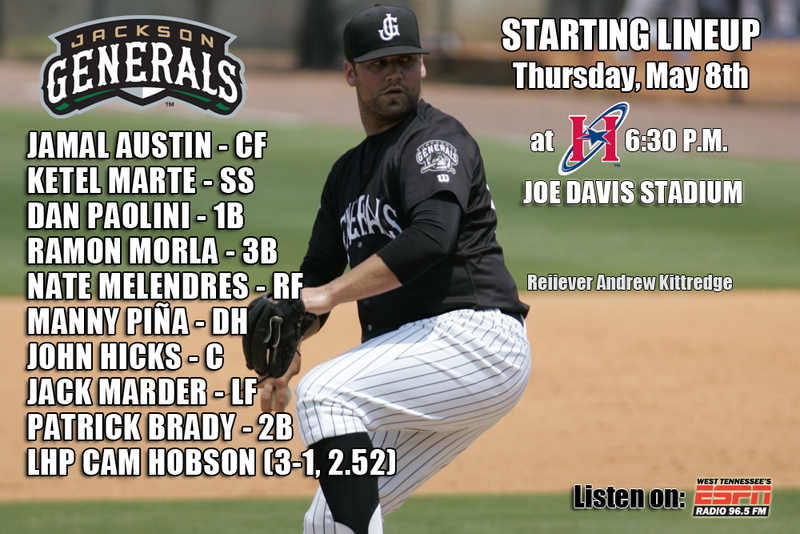 • The Generals play the 4th of 25 meetings with the Huntsville Stars tonight in game 4 of the series. The clubs will meet 15 times in Huntsville and 10 times in Jackson during the 2014 season. This is the final season of baseball at Joe Davis Stadium, which dates back to 1985. The club will move to a brand new facility in Biloxi, MS next season. • Last season Jackson was 9-9 against the Stars and 6-6 at Joe Davis Stadium.